Without a doubt Michael Daugherty has a nifty knack for a name. It’s a bit like a good news headline - you find yourself drawn in out of curiosity about what lies beneath. The two works here are perfect examples. 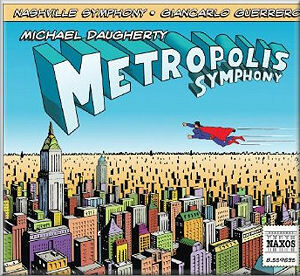 The one, Metropolis is a series of symphonic movements relating to the Superman comic strip, the other Deus ex Machina is far less clear in its “meaning” but more of that later. Michael Daugherty is one of those composers whose work sharply divides opinion. I have to say I am firmly in the fan camp. This is contemporary music as fun. Not to say it does not have passages of reflective and searching beauty but the abiding impression is of a composer who revels in using a modern virtuosic orchestra to spectacular effect. The Metropolis Symphony written between 1988 and 1993 was his breakthrough work. It is not a symphony - much more a symphonic suite - but this is underlined by the fact that each of the movements is playable as an individual entity. I suspect it might almost work better like that - heard as a sequence there is a certain lack of differentiation that diminishes the overall impression of the work. But that is minor carping. This is comic strip as music (a fact wittily underlined by the album art) - not the epic action movie style of a John Williams. The opening movement Lex sets the tone for the whole disc - antiphonal police whistles, terrifyingly vertiginous solo violin writing superbly dispatched - who is that masked fiddler!?! (actually it is Mary Kathryn Van Osdale who since she gets no separate credit I assume is Concertmistress in Nashville). Listening to more Daugherty you start to recognise compositional fingerprints. He clearly enjoys writing at extremes be they dynamic, spatial (a lot of antiphonal writing and phrases being tossed across and around the orchestra) or registrational (instruments playing at their physical limits). After a nominal slow movement Krypton which grinds from the depths leading to a final apocalyptic destruction of Superman’s home planet we reach the scherzo movement. Wouldn’t you just love hearing a radio announcer trying to pronounce MXYZPTLK?! Here the antiphonal effects are provided by a pair of duelling flutes. What I like is the way Daugherty throughout uses the vocabulary of contemporary music but in a way that clearly links it to more populist musical genres as well as making it compelling listening in its own right. This carried through to the final pair of movements which I liked most of all. Oh, Lois! is marked to be played “faster than a speeding bullet” and as Daugherty explains in his liner note it “..suggests a cartoon history of mishap, screams, dialogue, crashes, and disasters, all in rapid motion.” This is a perfect succinct description for a real romp of a piece quite brilliantly performed - as is the whole disc by the Nashville Symphony under Giancarlo Guerrero. Much play is made in some of the publicity material for this disc of a London performance being likened to a modern day Symphonie Fantastique. I guess in the main this is due to the dominance of the plain song Dies Irae which dominates the last movement much as it does in Berlioz’s work. That is one of the more fatuous parallels - you might as well say it’s a latter day Rachmaninov Symphonic Dances for the same reason. Metropolis has no need of any comparative crutches - it wholly succeeds on its own merits. The last movement Red Cape Tango is essentially a thirteen minute symphonic tango based in the main on the aforementioned Dies Irae chant for the dead. Quite whether it has anything at all to do with Superman I am not sure but it sustains a menacingly building tension brilliantly. Deus ex Machina is a much later work - in essence a piano concerto from 2007. Again to quote Daugherty; “Each of the three movements is a musical response to the world of trains”. Again this is a brilliantly scored work and is more an integrated whole than the preceding symphony. If I enjoyed it slightly less overall than Metropolis this is a purely personal response. It follows a traditional fast-slow-fast format with the emotional core being carried by the central movement’s evocation of the train that carried President Lincoln’s body back to Illinois in 1865. The final movement evokes the last days of steam in America and the booklet includes a beautiful example of one of the photographs by O. Winston Link that inspired it. Pianist Terrence Wilson dispatches the awkward-sounding piano writing with great aplomb. Much of the time the solo part leads from within the orchestral texture - perhaps more sinfonia concertante than true concerto but again this is to obsess over semantics. One final interesting thought though going back to my opening comment about titles. Deus ex Machina indeed does literally translate as “God from the machine” as Daugherty points out. However the derivation of the phrase is quite different. It comes from ancient Greek theatre and meant a theatrical/plot device whereby a character or situation was suddenly radically altered by the intervention of the Gods. Literally the actor playing the God was lowered into the performing space by machine to “save the day”. This was considered a weak plot device since it allowed for massive alterations with no dramatic preparation. One could argue - and this is the interesting point - that Super heroes are the ultimate modern-day “deus ex machinas” since they can be free “with a single bound” so perhaps this title should apply more to Metropolis! Not that it matters a jot but did Daugherty pick the title because it certainly is a good title or is there more at work here than he admits to in the liner? Naxos has been doing Daugherty proud in recent years - already their discs of his music are proving to be reference recordings (see review of 8.559165 - Philadelphia Stories). Engineering and performance here is ridiculously good. If I am being very very slightly picky, the sound on the last disc - (Fire & Blood Naxos 8.559372) was a fraction better - even richer and full-blooded than this but this is very good too and excellent value at Naxos’ give-away price and 75+ minutes playing time. To be honest any of the three Naxos discs are a good entry point into his compositional world. My guess is that if you like what you hear on one you will find yourself buying all three - I have!